Two teams of paleontologists were each puzzling over unusual, but incomplete, fossil skeletons of an animal they couldn’t identify, when they finally met and realized that they were all looking at different parts of the same dinosaur. And the dinosaur they’d found was the biggest of its kind on the continent. Measuring 3 meters tall and 3.5 meters from its beak to the tip of its likely-feathered tail, the newfound dino is the largest oviraptorosaur yet identified in North America. 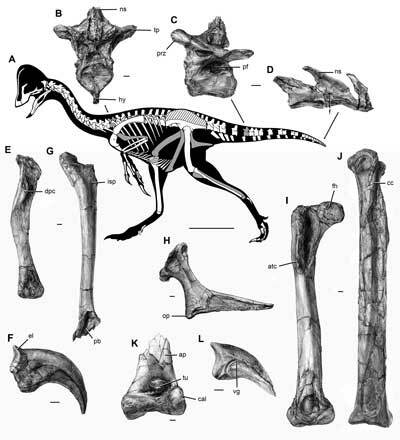 Oviraptorosaurs include some of the most bird-like of the non-avian dinosaurs, having sported feathers and beaks, and ranging in scale from the turkey-sized Caudipteryx to the earth-shaking Gigantoraptor. But almost all of these dinosaurs have been found in Asia, their sparse North American record having been pieced together through fragments from many different specimens. The newly discovered American genus — named Anzu for a Mesopotamian bird-demon — may open up a new chapter in our understanding of this type of dinosaur, the researchers said. “Anzu provides our first good look at an entire group of weird dinosaurs that had been shrouded in mystery for nearly a century,” said the Carnegie’s Dr. Matthew Lamanna, in a statement. Dr. Hans-Dieter Sues, of the Smithsonian, agreed. “For almost a hundred years, the presence of oviraptosaurs in North America was only known from a few bits of skeleton, and the details of their appearance and biology remained a mystery,” he said. Based on three separate specimens, each found in ancient mudstone in southwestern North Dakota and northern South Dakota, Anzu appears to have dwelled on the floodplains of the island continent that was Laramidia some 66 million years ago. 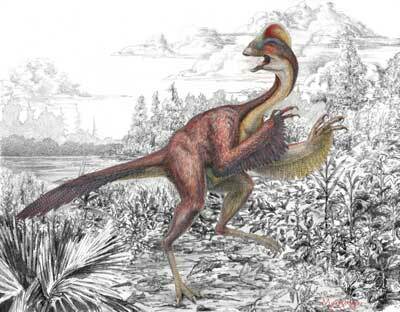 Judging by its large claws and powerful but toothless beak, the researchers suspect Anzu ate small animals and plants but was still no stranger to conflict. “Two of the specimens display evidence of pathology,” said University of Utah biologist Emma Schachner, who collaborated on the research. Schachner had helped Smithsonian collaborator Tyler Lyson excavate one of the specimens near Marmarth, North Dakota, she said, while the other two had been sitting in private collections. When Schachner and Lyson met Lamanna at a conference in 2005, they soon realized they were all studying different specimens of the same species. The team reports their find in the open-access online journal PLoS ONE.